Search engines are the main source of traffic for any website. But it will take time to get visits from the search results. And your organic traffic depends on several factors including the search trends, meta keywords, keyword density, and the number of backlinks you have from the top-level domains. Google will list your post among the top results after considering all these facts. But still, you can drive massive traffic to your blog or website. Do you know how? Social media. Create your social media pages, expand the network, and promote your posts among the followers. Interact with your fans regularly to boost the user engagements and page clicks. As a blogger, you should connect your site to the relevant social media pages first. Encourage your website visitors to join the network and thereby grow the social media traffic to your blog. Add a beautiful social media widget on WordPress along with the number of fans you have. It is the best method to promote your pages and enhance the social media reachability of posts you made. In this article, we share the 9 best plugins to add stunning social media widgets on the sidebar of your blog. Monarch is a great social media plugin for WordPress. It lets you show icons in different parts of the website such as above the content, below the content, on images, and as a sidebar widget. Being highly customizable, you can change the look and design of the sharing icons to match your blog design. Monarch is a premium product from Elegant Themes. It is fast, mobile-friendly, and comes with 5 hover designs for your sidebar to improve the user follows. 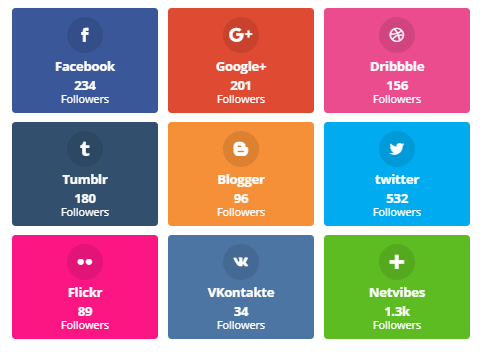 Social Fans is a popular plugin to create a social media widget with counters in WordPress. It is 100% responsive and supports more than 30 social networks to divert traffic from them. The plugin features 7 designs and skins to give a professional look to your sidebar. 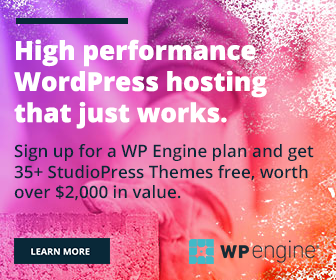 It is a gorgeous yet lightweight plugin that doesn’t affect the speed of your blog. Lazyload is another feature, turn it on to improve your page loading time again and deliver a trouble-free browsing experience to your readers. Access Press is a free plugin that allows you to show social media statistics using a widget or shortcode. Choose from the 5 responsive designs and select the social media accounts that you want to display. The basic version limits access to the 7 social networking sites including Facebook, Twitter, Instagram, and Google+. But that number will increase to 18 in the paid version of the plugin. Social Media Widget by Acurax is a free plugin to create social media widgets on your WordPress website. It is simple, customizable, and offers many options to manage the display of icons. Choose from 30 icon styles, configure your page links, and show them using a sidebar widget in your blog. The plugin contains icons of all leading social sites. So that it is a great choice to improve your network strength and traffic. 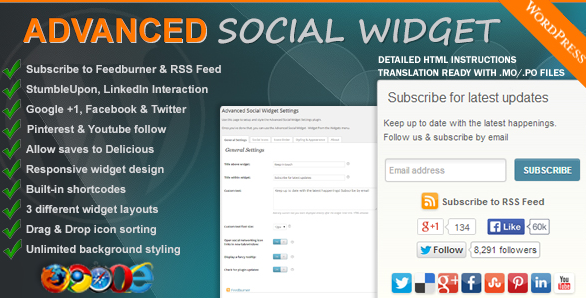 Advanced Social Widget is a powerful social media plugin for WordPress. It is an all-in-one tool to promote your social media accounts, shares, and RSS feeds. Being equipped with dozens of themes and layouts, you can customize the widgets as you like that fits your theme design. It is responsive, mobile-optimized, and easy to handle plugin to connect your readers to each network and keep update them about the latest posts. 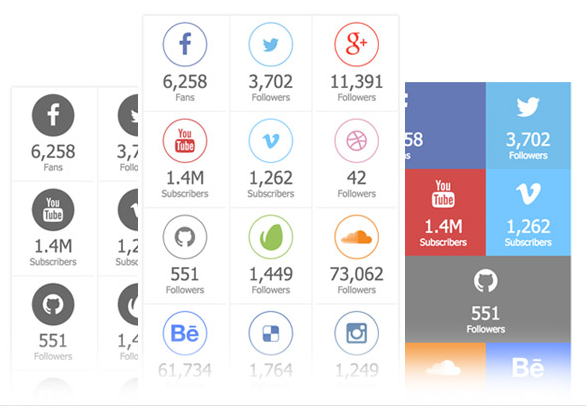 Arqam is another premium social media plugin from CodeCanyon. It will collect the latest counts of your social media followers from the networks and display them beautifully on your blog via widgets and shortcodes. It is lightning fast, responsive, and works on any device you choose. With Arqam, you can display the number of followers on any network and even the email subscribers to encourage more users to join your gang. The icons are available in 5 different styles and unlimited coloring options to give you full control over the widget design. This is a Mashable style sidebar widget. It is simple, easy to use plugin to add responsive social media buttons in the sidebar. It supports leading networks like Facebook, Twitter, Pinterest, Google+, LinkedIn, YouTube, and feed subscription in the lite version. Sassy Social Share is one of the best free social media plugins to add sharing icons and widgets in WordPress. It allows you to show beautiful, mobile responsive icons from over 100 social networks and bookmarking services. The icons are customizable in terms of their size, shape, background color, counter, position, and layouts. Sassy Social Share will be a perfect asset for your blog to improve the user shares, engagements, and the network. It also offers several advanced features like URL shortening, customizable target URL, compatibility with multiple platforms, and so on. It is another free social media widget plugin for your WordPress website. Social Media Flying Icons is a handy plugin to display icons in the form of a floating bar or a sidebar widget. It is lightweight, easy to use, and contains 30 responsive themes to link the icons to your profiles on Facebook, Twitter, Pinterest, Instagram, LinkedIn, YouTube, etc. 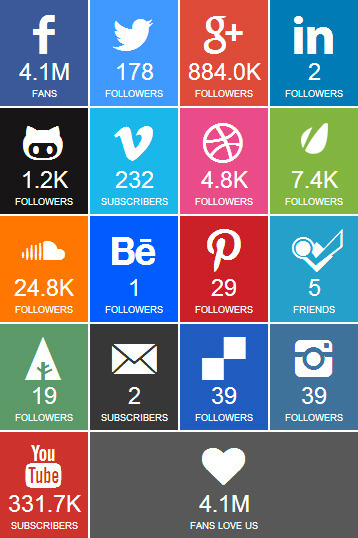 Which is your favorite social media widget plugin? Feel free to share your feedback through the comment form below.